The current account on the balance of payments measures the inflow and outflow of goods, services, investment incomes and transfer payments. A deficit on the current account means that the value of imports is greater than the value of exports. A surplus on the current account means that the value of imports is less than the value of exports. 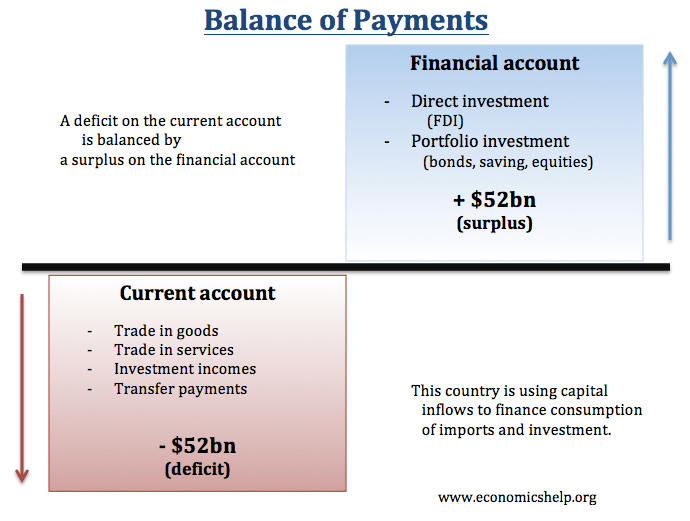 The balance of payments is composed of two main aspects. If a country has a deficit on the current account, it needs a surplus on the financial account. Therefore, there is a flow of money from the US to China to buy goods. But also a flow of money from China to the US – through the financial account to finance the purchase of imported goods. This shows the UK has run mainly a current account deficit since 1980. This means the UK has run a surplus on the capital/financial account. Imports greater than exports, so expenditure is leaving the economy to buy imports. Current account deficit may cause depreciation as there is greater demand for imports and foreign currency. A current account deficit may be a sign the economy is uncompetitive. Consumers prefer to buy cheaper imports than domestic goods. The benefit of a current account deficit is that it allows higher levels of domestic consumption than otherwise possible because we are buying from abroad. A deficit financed by long-term capital investment is more sustainable than a deficit financed by borrowing. Some countries like US and UK run current account deficits, but they have many foreign assets. Other countries like Russia and Venezuela have experienced a balance of payments crisis because they have been adversely affected by a fall in the price of oil which damages export revenue very quickly and developing countries more vulnerable to international investors withdrawing. 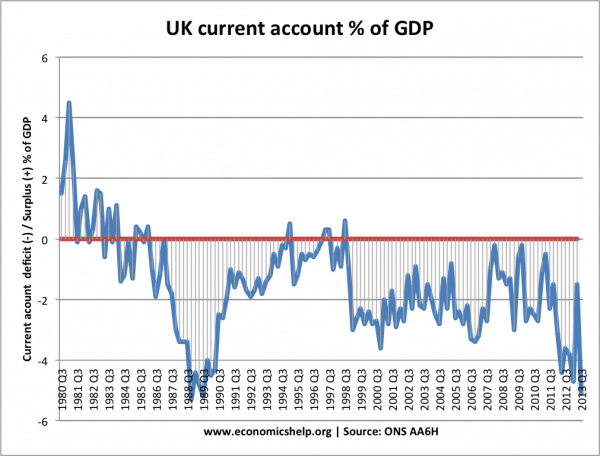 Should we worry about a current account deficit? Spain, Greece and Portugal all had current account deficits close to 10% of GDP – a sign of a major imbalance in the economy. Exchange rate could fall – causing inflationary pressures. This is more of a problem when a country follows some kind of exchange rate target, e.g. the UK in 1976 crisis. A deficit financed by financial flows could be vulnerable to capital flight if foreign investors decide to sell assets and return the money. This is a problem for developing economies who become seen as a risky place to invest. 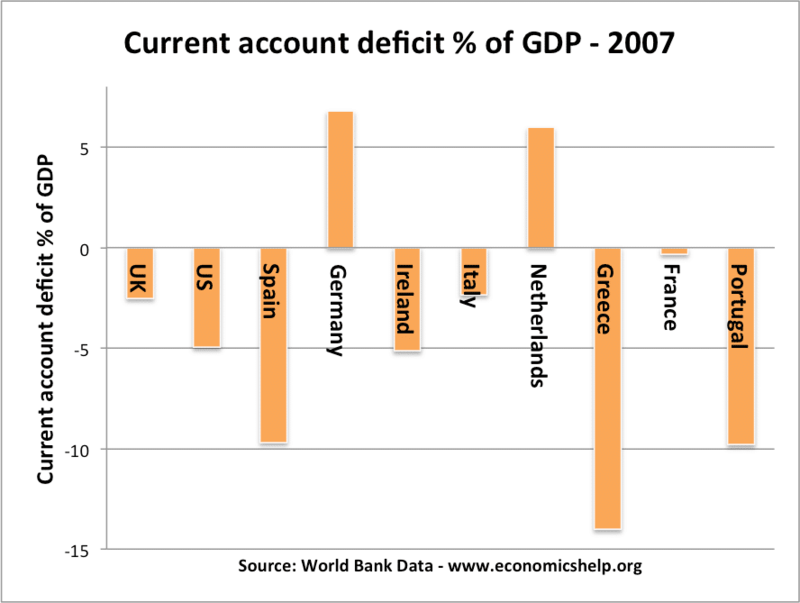 In the Euro, large current account deficits of Spain, Greece and Portugal were a sign of an uncompetitive economy. In the Euro, they couldn’t devalue to restore competitiveness leading to lower economic growth because of depressed export demand. With current account deficit, foreigners have an increased claim on domestic assets. However, other economists suggest that concerns over current account deficits are misplaced – so long as the deficit is ‘manageable’ and financed by sustainable capital flows. UK and US have run persistent current account deficits for long periods without any adverse impact. Current account deficits financed by capital flows mean the country is attracting Foreign Direct Investment (FDI) – which is increasing domestic productive capacity. More detail on – Should we worry about a current account deficit? How to reduce a current account deficit? Devalue the exchange rate – cheaper exports and more expensive imports should improve current account. But, this will conflict with objectives of higher economic growth. Supply-side policies – in the long term, efforts to improve productivity can improve the competitiveness of exports. More detail on – how to reduce a current account deficit. A trade deficit refers to just the balance of trade on visible goods. This trade deficit is a component of the current account. 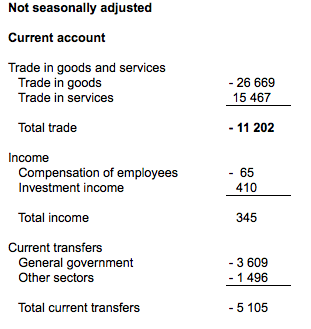 The UK has often run a deficit on the trade account, but run a surplus on services.